That sounds good, doesn’t it. But at best, the claim is only partly true. The article is actually about energy-related emissions. . Now this is clear enough if you read the article carefully, “Preliminary data for 2015 from the International Energy Agency (IEA) showed that carbon dioxide emissions from the energy sector have levelled off at 32.1bn tonnes”. Yet the previous sentence says: “Falling coal use in China and the US and a worldwide shift towards renewable energy have kept greenhouse gas emissions level for a second year running, one of the world’s leading energy analysts has said.” And here is the clue: the “leading energy analyst” is none other than Fatih Birol, Director (and former chief economist) at the International Energy Agency. The IEA was terribly slow in waking up to the promise of renewables and still maintains a thoroughly orthodox position on the relationship between economic growth and emissions. “Decoupling of global emissions and economic growth confirmed”, although the subheading again makes it clear that it was “energy-related emissions of CO2 [that] stalled”. And Birol is quoted as saying: “Coming just a few months after the landmark COP21 agreement in Paris, this is yet another boost to the global fight against climate change.” This would indeed be good news, but let’s take a look at the data. This might suggest that the triumphant tone is misplaced. To what extent are these changes temporary? To what extent might they be overtaken in years to come as cheap oil and gas continues to be exploited? To be sure the increase in Chinese renewables from 19% to 28% of electricity generation in four years is to be welcomed, as is the 10% decrease in coal, but as the New Climate Economy (a cheerleader for economic growth decoupling from emissions) reported on p. 17 of its report last year, even as late as 2030, fossil fuels globally are projected to increase by 64GW annually. In the case of China, the 5 year plan meanwhile forecasts that “Energy consumption and carbon dioxide emissions per unit of GDP will be reduced by at least 3.4% and 3.9% respectively”, while “GDP is projected to grow by 6.5-7%”. So the Chinese themselves are effectively stating that there will be no decoupling. And research on the extent of methane leaks from US shale gas production, that could wipe out other energy emission reductions ,also indicate that it is a little early to celebrate. These figures, it should be noted, represent the flow of CO2, from one source, into the atmosphere. However we are dealing with a system of flows, from other sources such as changes in land use and into carbon sinks in land (chiefly biomass) and sea: the interactions between these flows, over time, determines thestock of GHGs in the atmosphere (see this article for a longer discussion). There is no sign of a decline there. If we look at the annual increases, again there is no sign of any decline. 1) It shows that any suggestion that GHG emissions are stalling is not supported with solid long term evidence. Only the flow of emissions from electricity generation is doing that, and it is by no means clear that this is a durable trend. We hope it is, but it might not be, and anyway it isn’t enough because overall emissions are increasing. 2) Since energy-related emissions have not increased for the last two years, then other emission sources must be increasing at a greater rate. There are several components to this. Firstly emissions from human activity other than fuel combustion – e.g. cement manufacture (other than fuel use) and waste disposal. Secondly, release of GHG’s from sources such as forest fires, permafrost thawing, soil degradation, and ocean stores (this includes the indirect results of human activity). (For a full dataset, see here). Thirdly, there has been an exacerbation by this year’s El Niño event (but we have to ask why El Niño is so strong this time). It shows levels of atmospheric CO2 (again from Noaa) and global GDP (IMF) over a 45 year period. Here is the same data with each measure plotted against the other to show the association between them. The thin line is the line of best (linear) fit. You don’t get better associations than this: the shared variance is nearly 99%. In the first graph, however, the GDP line is steeper than the emissions line, possibly indicating the well-known phenomenon of relative decoupling. We However, as discussed previously, CO2 levels are still growing with GDP even though the economy gets more efficient in its energy use. But as Jevonsdemonstrated in the nineteenth century, that reduction of energy intensity of economic activity leads to greater overall economic output, thus compounding the problem: the more that is saved, the more growth there is and therefore the more emissions. It could be objected that data on levels of CO2 is not relevant to evaluating the claim that emissions have decoupled from GDP. However, it is clear that levels are increasing. Where from? We would have to look to the totality of emissions that originate from human activity, which corresponds (if crudely) to GDP. Although global GDP growth is slower than it once was, it continues nevertheless. To look at the association between increases in levels of CO2 and increases in GDP is, thereby, relevant to the decoupling hypothesis, even though the proponents of decoupling are not claiming that CO2 levels are decreasing. So, yet again, claims that GDP growth has decoupled from carbon emissions are shown to be mere propaganda. 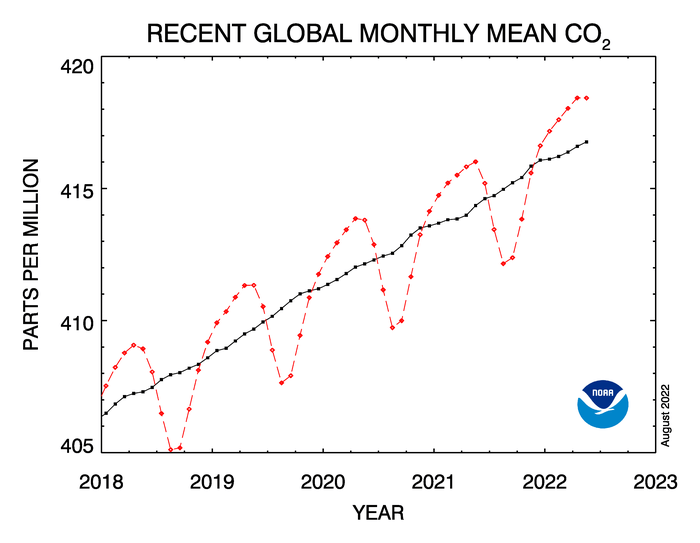 And as February’s CO2 figures showed, we are in a very scary place indeed. It is incumbent on all of us to try to understand these relationships and to resist the tales told by those with vested interests in the current destructive system and struggle for an economy that is viable, ecologically as well as socially and economically.. This article was first published on the Steady State Manchester website under a creative commons licence and has been revised on 29 March to a) correct the original text which wrongly stated that the IEA data in graph 1 only covered emissions from electricity generation, and b) to clarify further the relationship between the flow of emissions and the stock of CO2 levels in the atmosphere. How Far would Germany’s 2038 Coal Phaseout Breach Paris Climate Goals? The Decoupling Debate: Can Economic Growth Really Continue Without Emission Increases?